A Year for All of Us to celebrate! The next few pages are a picture, sound, and story-filled tribute to one of Buffalo's great radio stations... WBEN Radio! 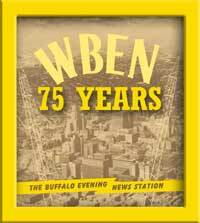 With the help of dozens of WBEN Alumni, these pages have been crafted into a history of the "Buffalo Evening News Station." A little disclaimer: While I do work at WBEN (again!?! ), this site is by no means in anyway affiliated with WBEN or Entercom. Please click on the links below for Alumni Thoughts, Bios & Memories, Pictures, and the soon to be expanded sound. Have a WBEN story, picture, or sound to share with the world? E-mail us! We'd love to add your memories! Also be sure to visit the rest of staffannouncer.com for More pictures, memories and fun! or Click here for the staffannouncer.com homepage! For questions or submissions... Drop me an E-mail!